There are a lot of different skills that need to be learned to obtain your Private Pilot's Licence (PPL), and one of the most interesting and challenging to learn is that of navigation. It is a subject in its own right and when used in conjunction with all the other things involved with flying an aircraft takes a lot of getting used to and can be demanding to say the very least! Many a student pilot has planned a cross country route exercise, flown to that destination and then beamed confidently at the instructor on board that they were at their destination only to be told that they were more than 10 miles off course and - now get us back home! An up to date 1:500.000 or 1:250.000 aviation chart of the area to be navigated. The human thumb! If the thumb is placed onto a 1:500.000 chart the distance measured from the tip of the thumb to the first bend is approximately 10 nautical miles and can be used a rough guide to estimating distances on the chart. This also means that if the estimated ground speed is known then the leg time can be estimated i.e. 10 miles at 120 Knots equals 5 minutes. Rulers calibrated to measure distances in nautical miles on 1:250.000 or 1:500.000 charts. Some are also calibrated for multiple standards. Protractor of various shapes and sizes used to measure track angles on charts. Flight computer - a mechanical device used to provide a wide variety of calculations such as speed, time, wind, drift etc. Some of the basics of navigation skills needed involve making a flight plan, using dead reckoning and map reading. A route is created by first marking the legs of the journey onto an aviation map using an indelible pen so that it does not rub off in flight. Where possible it is better to use points on the map marked as VRP or Visual Reference Points as these are usually more easily spotted from the air thus making it easier to establish your location during flight. It is now possible to measure the distance and heading between any two points on the map and after taking into account wind conditions, magnetic variations and aircraft speed calculate the time and true heading between those points. The final part is to mark the map with 10-degree fan lines on the start point of each leg so that drift can be estimated at stages along that leg. Halfway points should also be marked on each leg or more if it is a long leg as well as the wind direction. Then fill out a flight log sheet containing the heading, distance and estimated time taken for each leg of the journey. Once the journey has begun, the take off time is noted and an ETA, Estimated Time of Arrival, to the next leg of the journey is calculated and noted on the log sheet. One of the methods to detect any drift off course at the halfway point on a leg is to identify landmarks located within the fan lines previously drawn on the map and estimate in degrees the course error. This can then be corrected by steering in the opposite direction by twice this angle i.e. 10-degrees off course to the left then turn 20-degrees to the right for the remainder of that leg. Magnetic Compass -fitted to just about every aircraft and it provides a very good indication of which direction the aircraft is travelling in but the reading can be very jittery during flight especially in turbulence. Heading Indicator - uses a vacuum or electrically powered giro and is similar to the compass but far more stable. 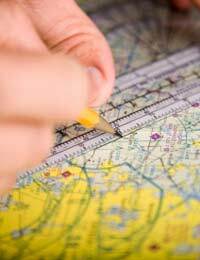 It does require realignment against the magnetic compass at the start of and periodically during the flight. Watch/Stopwatch - used to record and measure time of legs of the journey. ADF (Automatic Direction Finder) - has a needle that points to a ground based NDB (Non Directional Beacon), which is a simple AM radio transmitter. Works well but is susceptible to interference from thunderstorms and other sources. VOR receiver (VHF Omni-directional Radio) - enables aircraft to select a radial and follow it to or from a ground based VOR transmitter. DME (Distance Measuring Equipment) - Indicates how far the aircraft is from a selected DME ground station. GPS (Global Positioning System) - the ever popular satellite navigation system that comes in many forms and functions. Flying can be great fun and once you have mastered navigation you are well on your way to being a pilot.